Smartwatches are loveable devices! Not only do they look splendid (well, unless your standards are Swiss-high), but they offer little bits of functionality that, really, no other device can. Yes, although we doubt smartwatch will ever have a 'killer feature' - one to put them on every wrist like smartphones are landing in the hands of millions of people as we speak - they are, nevertheless, very nice to have. If you weren't an early adopter who took home an LG G Watch R, or a Moto 360 or a Samsung Gear and such, you might have slept on the fact that there are hundreds of apps already running on those adorable smart tickers. But don't worry, if you ever get one, you'll get up to speed in no time - especially if you check out our selection of some 25 Android Wear apps we consider essential for smartwatch owners. Enjoy, and be sure that there's plenty more where that came from! Todoist for Android Wear lets you add tasks using voice commands, view optimized notifications at a glance, and send task lists directly to your wearable. This app gives you a contextual notification on your wearable device when your phone is out of range, or your phone battery is running low. It also has 'Find my phone' functionality and lets you check the connection to your smartwatch. Aeris Wear brings weather and radar to your wrist with instant access to current weather conditions. In the app's pro version, which costs a dollar, you'll have access to all 9 of our cards and the ability to customize your card order. The Pro upgrade features all cards offered in the free version plus makes satellite and advisory cards available. Upgrading can be conveniently done within Aeris Wear for only $0.99. This app is all about weather watch faces. Not only do they look cool, they also show you convenient information. There are two radar maps combinations, 24-hour forecast with temperature, a minimalistic forecast in 2 versions - digital and analog, as well as a stylish LCD + analog Watch Face combination; But if you aren't into weather watchfaces, you might as well use the standalone Wear App that's available - it has all the features and functionality, as well as a special low power, low bit mode on supported Android Wear devices. The app runs on the Sony SmartWatch 3, Motorola Moto 360, Samsung Gear Live, LG G Watch, LG G Watch R, and Asus ZenWatch. This is a smart alarm clock app bundled with elaborate sleep cycle tracking. In addition to waking you gently in an optimal moment for pleasant mornings, the app features Pebble, Android Wear and Gear (Tizen) smart watch wrist-tracking, Philips HUE smartlight integration, sleep graph history, sleep deficit, deep sleep and snoring statistics, gentle volume nature sound alarms (birds, sea, storm), and tons more. Don't sleep on it! Wear App Manager manages the apps you have installed on Android Wear from your smartphone. At this moment, Android doesn't distinguish Wear apps from regular apps, which makes organizing them a bit messy. But here, you can see and manage all your Wear apps easily. In addition to that, you can see what permissions each app is actually using on your wearable, how much space it's taking, see apps installed only on the watch (in development, or sideloaded), and those whose watch components are missing. Great tool! Wear Battery Stats lets you monitor your Android Wear device's battery life. With this app you can track the battery level, determine if an app causes battery drains, and get notified when the battery percentage or the remaining time fall below a certain level. WIB is a (mostly) full fledged web browser running on your Android Wear smartwatch. The experience isn't great, but this isn't because of the app - the app is solid, but the medium (watches' tiny displays) makes it a drag. Still, you can totally search the web (with voice or text search), have quick access of bookmarks and history, open links in the Wear Internet Browser from your phone via Share, and you can even use a mini keyboard (in English, French, Russian, Spanish, Italian and German) - all on your wearable. The nicely featured browser is compatible with all Android Wear smart watches. WearTasker makes it possible to run any task you created with Tasker on your phone straight from your wrist using an Android Wear Watch. The free version allows you to configure up to three tasks. Wanna have apps, contacts and bookmarks in Apple Watch style on your smartphone or Android Wear watch. That's the app for you! The more you use a certain app, the more its bubble will grow in size, making it easier to access. Facer is a popular watchface designer for Android Wear. There are thousands of free watchfaces available to users, and with powerful design & editing tools, the possibilities are very much endless. Wear Tip Calculator lets you calculate the tip straight from your wrist. It's the most convenient way to approach this by miles, and the app's design is superb too. This is a remote surveillance, control and video recording app for your private/public network or IP cameras, video encoders and DVRs with CCTV cams with 5+ million downloads. It lets you monitor your baby, pet, home, business, traffic, and weather remotely and securely from smartphone and watch. It's a very professional app that all owners of DVR and CCTV systems should take a look at. An absolutely essential app for Android Wear owners. It's the app drawer that's sorely missing from Android Wear. It makes opening smartwatch apps and controlling smartphone toggles very convenient, and it's quite customizable as well. Pujie Black is another popular watchface app with many great features. It comes with 10 presets to get you started, custom colors for all elements, Google calendar integration, a set of 13 analog hand types are available and an optional digital clock to toy with, a weather indicator, phone & watch battery indicator, date indicator, and tons more stuff to tinker with. Wear Aware acts like a leash between your phone and your Android Wear watch. It helps you find works like a short range "Find my Phone" app to help you locate your phone when it's out of sight. Just say "OK Google, Start Phone Finder", and your watch transforms to a phone locator. Totally free app, and a total keeper as well! If you need a very basic calendar to put on your smartwatch, this one's it. This one lets you send text to your wearable device and float it as a card. This sounds simple and "meh" (for lack of a better expression), until you put your grocery list on your watchface and go about shopping without holding your smartphone in one hand, or reaching for it in any way. The free & ad-free apps functions on Android Wear and Pebble devices! Wear Reader lets you read books straight from your wrist while you're on the go. Trust us, it is better than it probably sounds! Simply upload your favorite book to your Android device, pair your Android wear, and you're ready to go! There's even a night mode for late-night reading in the dark. Wear Reader can import books from ePub, PDF, Docx, and text formats. Wearable Widgets builds a "bridge" from your phone to your wearable device for the thousands of widgets on Android. The free app supports unlimited usage of one widget at a time. Now here's a handy and free calculator for Android Wear watches. It does standard and extended operations, and you can choose between 2 color themes. Just don't let your math teacher spot you mingling with your Wear's screen on that math test. If you're looking for a wearable voice recorder, check out this one. It works for smartphones and Android Wear watches alike. It lets you record your conversations, lectures, meetings and such with a simple and intuitive interface. This is a remote control and smartphone camera viewer for your Android Wear smartwatch. By way of it, you can take better selfies, group shots, watch a live stream of your kitchen pot, cat, or anything else as long as you have Bluetooth range. Wear Messenger is an app which greatly expands your ways to text with your fingers. It has conversations (SMS, MMS), four different keyboards and support for third party ones (such as Minuum), dictionaries, and swipe controls adapted for the wearable display. Use your wearable as flashlight. You won't believe how convenient it is until you end up in the dark. 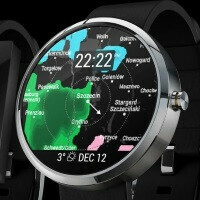 Android wear look like its getting better and better. May get it later part of the year. Some pretty cool apps list, thanks ! Treycent - Voice Photos app is pretty cool it lets you load photos by voice to your watch or phone. You guys missed Wear Charging. This collection unearthed a lot of hidden gems! I downloaded the Bubble Launcher, still trying it on my sw3, but it feels to be even more capable than it seems on the surface. Most intriguing is what they call the watch face launcher. Still has some glitches, but the idea is really cool,,, this is the first real launcher in the sense we think of them on phones and tablets: you can return to the home screen to start applications. Not just an app tray like other wear launchers. Very curious which way this project will go. Lazy journalists! not a single workout app like runtastic or something else. Its the most important thing for me to get a smartwatch. Sony smartwatch 3 with gps and ability to listen to music without take the phone with me. Wear Tasker is there. It's going to continue to enable fantastic features. Watch faces is a killer, too. Facer is there. That's good. However, I'd like to see Watch Maker, too. It enables amazing watch faces, with moving elemens, tourbillons, many layers, and visual effects. Check it out on the Google+ group. Great list, thanks! There is an app that turns your Android smartwatch into a humor hub. The most wasted of all days is one without laughter. ​Jokester App will keep your mood up by displaying hilarious jokes on your smartwatch. hey guys try TOGGLE WEAR for your Android wear its really useful app. you will find it on play store.